Strange things are happening in a weird building that emerged from the ground... It's up to you, the trashomancer, to investigate what is happening in that place! But you never liked getting your hands dirty anyway so you decide to send your minions made out of the trash you find lying around everyday. Play with your friends as the true disposable and recyclable heroes! Permadeath, but you recicle your hero anyway so you can't really die... permaundeath? The game is being written in LibGDX and will hopefully be released on PC, Linux and Mac! We will be using Tiled Map Editor for creating the maps and the characters and most of animations are being made using Spine. And this is what it turns to! Here are 4 possible trashomancers we came up with (update 5) but still can't decide who to use... Can you give us any suggestions and/or opinions on the designs? Thanks in advance! We are a 2 men team called Fat Pixel Games. I am the designer and im charge of graphics, music and stuff. My pal is the one doing all the coding, and he has a saint's patience. We are just starting making games on our own after some bad experiences in past attempts, as you can see we have no website yet and we are not exactly what you could call social media experts so every suggestion on these subjets are welcome! Update: now we've got Twitter and website will be up soon. Sounds interesting. Will the hero be expandable in size as well, like eventually turning it into a big trash heap monster if you've made enough progress? We thought about that in the beginning, but making a good animation system that works for most posible sizes is quite difficult. At one point we thought about a job that let you transform into a golem made of a bunch of items if you collected enough, that idea is still in the air but we also have to think how to balance that in order not to interfere with our hp system. You begin being made out of 2 items, with a separate hp bar for each item. Each time you gain an hp granting item, you get 1 hp point for both of your items. If one of your items gets broken, you'll loose that hp bar and you will grow arms or legs in the remaining item. At this point if you have to get more hp the only way is reconstructing yourself with another item. By doing things this way we give the gameplay a bit of a push up in pace, making you think less about which item you want to reconstruct yourself with (there won't be many laying around) and think more on how to adapt to the new characteristics of your new item. We'll think about giving other possible uses to trash you find if you are complete. GAH! LOOK AT THAT APPLE MONSTER! I love this for obvious reasons. Seriously though, I quite like the idea of assembling your character out of parts. There are so many possibilities. Although some of them technically complicated, like the one you mentioned: making a huge monstrosity requires adapting the animation. But it would be awesome if it went beyond aesthetic though. Maybe a bottom of something soft gives you no fall damage, some parts could have different 'armor' properties. I don't know, I'm just babbling now. When I saw your living apple main character I had a good laugh since it looked just as absurd XD. I guess apples has that something. 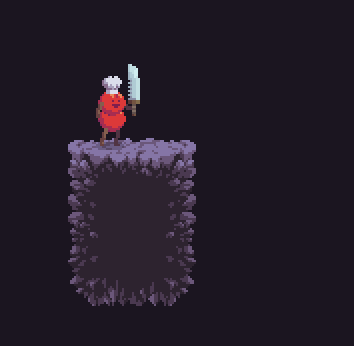 By the way, I started testing up some tiles tuff. 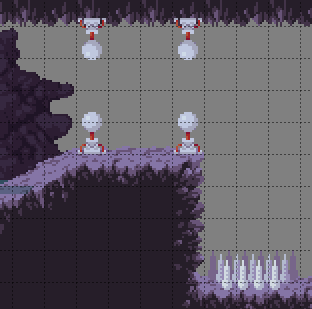 I'm starting with a cavern environment because it seems easy to do, stay tuned! Your trash heroes are fantastic . Even if there was no game, I'd want the trash hero generator. We got tiled maps up and running and we did a nice water system, check these out! 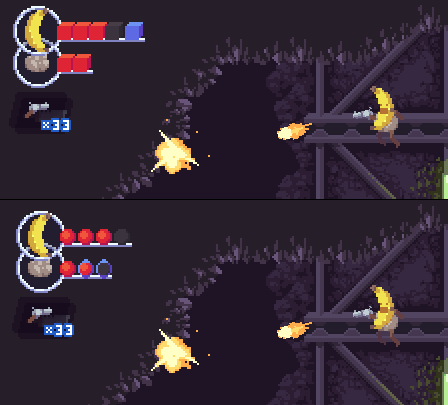 Serious banana and patrol skull now enjoys a good dose of parallax. I'm not entirely convinced with the last parallax layer, I might redo it when we start polishing stuff and testing maps. Cool stuff! The trash hero system is real neat. I want to discover the best trash. This looks amazing, looking forward to seeing some more. Aaaand here's a funny debug feature that unfortunately won't be available in the final version, but it is too funny not to post! The environment looks really nice. The palette also makes the character read well. Thanks a lot for that comment really. Environmental art is not exactly my strong point as an artist and I'm working really hard to make it work nicely . 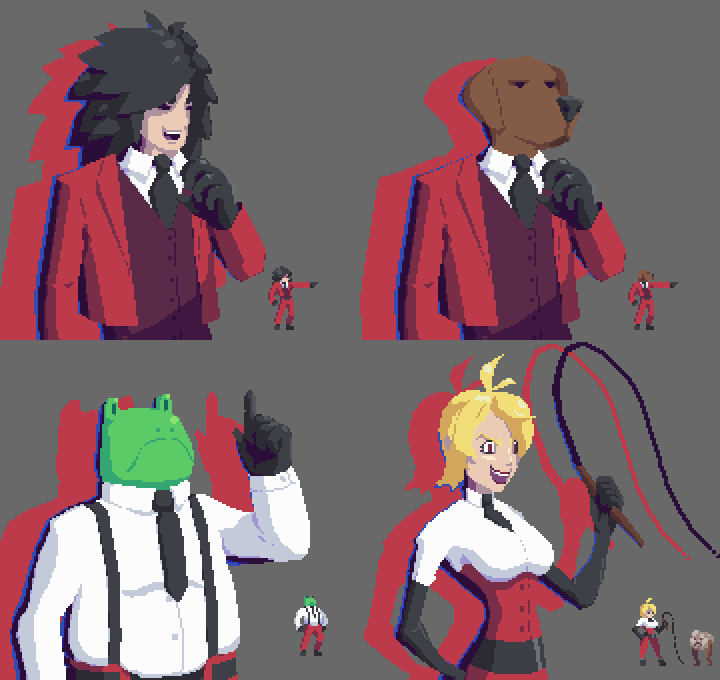 As for the palette what I did was use way more saturated color for the main characters and more dull stuff for the platforms and terrain you collide with, that certainly did the tric! Still very work in progress, but you can gather other parts now! We are having some troubles deciding who the main character (the trashomancer, who you actually never control) will be . He has to look somewhat powerful but lazy, or at least not willing to do anything by himself and rather sending others to do the job. Here are 4 designs we came up with, any suggestions? is there anyone you specially like/dislike? haha great character designs. i like them all, but my favourite is the dog. don't know if he is suitable as the main character though, he looks more like an ruthless corparation type of guy to me.